Last week I dropped my phone in a toilet, and accordingly lost my most important earthly possessions: photos, contacts, a meticulously kept folder of reaction GIFs. But when a friend lent me a partially functional replacement, it became clear it wasn’t so much the modern world I was missing; there’s always emails and Gchat for that. It was Meek Mill’s Bike Life, the rapper’s App Store-topping game and my latest obsession, that I couldn’t live without. 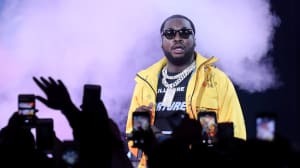 The game is one of a handful of things Meek Mill has his hands in this year, having just released Dreams Worth More Than Money and revealed that another album could be on the way pretty soon afterwards. But Bike Life isn’t the mediocre, label-cooked, not-worth-its-weight-in-data-storage app I’ve come to expect from celebrities. It’s a thoroughly engaging, delightfully simple first-person "endless riding" game that lets players try their hand at a digital re-imagination of one of Meek's favorite pastimes: ATV riding and dirtbiking. In the game, which is available for both iOS and Android, players can play as either Chino, an avatar based on real-life street rider Chino Braxton, or Meek’s friend Omelly, both members of his DreamChasers crew. For $1.99, you can also play as Dirt Bike Rell, the legendary Philly stunt rider who passed away last year. The game also features a pink bike that looks like it could belong to Nicki Minaj. But, for now, the goal is to collect enough coins—at least 150,000—to play as Meek Mill, making Bike Life a weird cross between Need For Speed and Kim Kardashian: Hollywood. When I first downloaded the app, I figured I’d just give it a quick look-see and delete it from my phone. But alas. A couple of weeks later, I found myself staying up late, doing wheelies down Philly highways, jumping over potholes, and swerving to avoid the copious amounts of siren-blaring police cars. In fact, there is such a heavy police presence in the game that it seems to be a statement about the relationship between civilians and law enforcement. Per the game's official description: "Players will compete against others and gathering coins and performing sick tricks as they mock and evade police apprehension." As fun is it is, though, Bike Life is challenging. It took me several days and, I'm humiliated to admit, $3.99 worth of purchased coins to get past the first level. Plus, every time you get hit by a car, there is a deep thlunking sound and a bounceback so jarring that it feels like an actual accident. After watching me recoil intently from being hit by truck after a truck, a stranger on the train felt compelled to make sure I was okay. But the persistence is worth it. Brand-new phone in hand, I'm only a few thousand coins away from being Meek Mill. There are still countless wheelies and magical golden bikes ahead of me, which means that I'll likely be playing Bike Life for as long as I keep Dreams Worth More Than Money in rotation.